I enjoy using rock beads and other “organic-looking” materials. This spiral rope stitch was one of the first beading patterns I learned. Once you get the hang of it, you can easily complete a shorter necklace during a movie. For my project, I used the Twins as the core of a double spiral rope bracelet. Here are the instructions so you can … 5 g 11/0 seed beads (permanent finish galvanized silver). glass hula hoop (hobobeads.com). 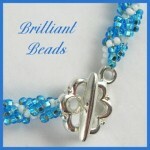 2 4 x 6 mm drop beads. Fireline or WildFire, 6 lb. test. beading needles #12. 1. On a comfortable length of Fireline of WildFire, and leaving a 12-in. (30 cm) tail, pick up two Twin beads ….